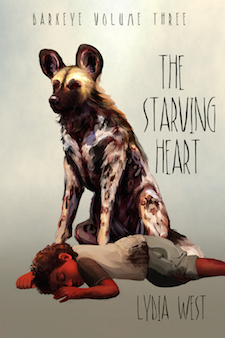 The strange howls were coming closer, hour by hour, and Mhumhi was certain that they came from more than one throat. They had regrouped back around the fire pit. To Mhumhi’s surprise, Hlolwa walked up to meet them there, her mouth tight. But then again that made sense; the howling would not come from a painted dog, and so she had no way of telling whether it was a friend or foe either. “Get the hulkers out of sight,” said Hlolwa. They all turned to look at her. She gazed back flatly. “I can go,” said Sekayi, struggling back up against the wall. “You stay out here, maybe I’ll eat you myself, little devil,” said Hlolwa, and she took a step towards him. Tareq’s face screwed up and he ran to grab Sekayi’s hand. Kutta jumped in front of them with a snarl, raising her tail. Hlolwa looked away coyly, licking her lips. Mhumhi saw a hint of amusement in the way she gave a small wag of her tail. This caught Kutta off-guard, and she passed an uncertain look to Mhumhi. “Only if they think we have more backing us up,” Mhumhi said. “Then I should go with you,” said Kutta. “Someone should stay here with Tareq,” Mhumhi said. Kutta merely fixed her with a yellow stare. Mhumhi began to feel distinctly uncomfortable. He went over and licked her ear, then trotted to the top of the valley, where Hlolwa stood waiting for him. “Let’s set a swift pace,” she said. It was still strange to Mhumhi that a swift pace meant stretching his legs to their fullest; but then again he’d never run with anyone who could match him stride for stride. They flew across the hills together, coursing side by side with their ears slicked back. Mhumhi felt a kind of tremor, like Kutta’s concern wasn’t unfounded, but then again, that would be ridiculous- he wouldn’t abandon his family over something like being able to run faster. Still, it felt good to run as hard as he could manage. They heard the howl again and Hlolwa skidded to a stop, knocking tin cans this way and that. Mhumhi overshot her slightly and wheeled back around to join her. “They’ve moved more that way,” said Hlolwa, indicating the left with her nose. She was panting a little. Mhumhi raised his head, nostrils flaring. It was hard with the ever-present reek of the dump, but he did detect a doggish thread in there somewhere. “A bit,” he said. “Not enough to tell what they-” He stopped, and stepped sideways, curling his tail underneath his belly. Hlolwa had moved very close to him, her nose almost touching his haunch. Mhumhi raised his back leg and twisted his neck a bit to look at it. The bald, pinkish line was still there, and as if it had been awoken, he felt a twinge from it. “Of course,” said Hlolwa, and started running, though this time at a slightly more sedate pace than before. Mhumhi eyed her belly and decided not to push it. “That sounds very lucky,” said Hlolwa. He couldn’t help but glance at her, for this. Her expression showed little. He gave a little shriek then, because a searing pain had opened up on his scarred hind leg. He tumbled over before he realized what had happened. Hlolwa had attacked him, and even now was worrying his back leg. Mhumhi thrashed, still comprehending what had happened, and crying out from the pain. Hlolwa released him and jumped back. Her eyes flicked to him for a split second, and then she spun around and sped away. Mhumhi gave a wordless yelp and tried to struggle to his feet, but his bad leg buckled. It was bleeding, new wounds opened up over the old scars, and the ache of it was coming back like an echo. Hlolwa had vanished from sight. She was moving faster, Mhumhi realized, than she had been when they’d been running together at his top speed- Damn! Damn! She’d been testing his pace all along! He struggled to his feet, keeping his bad leg raised. There was no way he could hope to chase her down now. And besides, he had a much bigger worry now: there were gray forms moving down the hills in front of him. Hlolwa had timed her escape to just before they met the other dogs. There was nothing he could do. He limped around to face them, as they came closer. There were many of them Many more than five… at least ten… perhaps more. They swarmed down the trash, their eyes bright, yipping to one another. One near the front noticed him and stood stock still; then the awareness seemed to spread out through them like a ripple, until they were all staring silently at him, a horde of gray forms with yellow eyes. Then they were all rushing him, bounding at him with such fervor that he stumbled and nearly fell over again. They greeted him noisily, all yips and wagging tails and warm tongues on his chin and neck. He struggled to comprehend what they were and how he knew them until one of them- a coyote- ran in front of him and fell into a play-bow. “Been killed?” Telipa tilted her head. “What’s happened to your foot?” cried a jackal, circling behind him to lap at his blood. He flinched away. “There’s only one left-” started Mhumhi. There were yaps of agreement throughout the crowd as they milled around him; Mhumhi realized he was simply going to have to adjust to this high energy level. She turned and pointed with her muzzle up to the top of a ridge of trash behind them. Mhumhi was startled to see a line of silhouettes- hulker silhouettes. Ah, the million dollar question, that keeps coming around… And now Mhumhi has to burst poor Telipa’s illusion bubble.